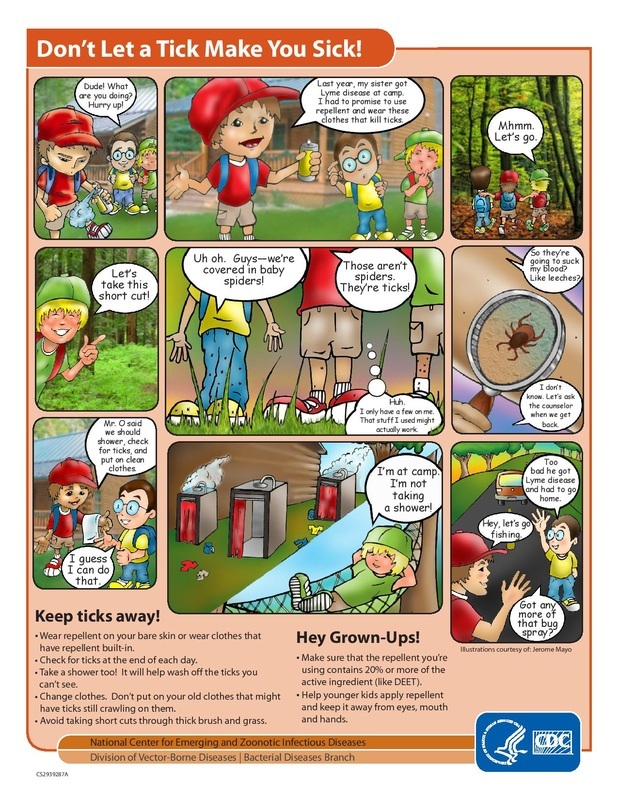 See the Crawford County Health Department's tick brochure here! Ticks are a common pest that are encountered in the outdoors. Ticks are very efficient carriers of disease because once attached, they may go unnoticed for a period of time while they feed on their host. Ticks are commonly found on grass, weeds, and shrubs and will wait until a host moves by, when they will let go and climb onto the host. Ticks become more active when ground temperatures reach 40 degrees F, with peak activity occurring in the late spring and early summer months. There have been reports of ticks attaching themselves to a host in winter months. Ticks are found in two groups: "hard" ticks and "soft" ticks. As their name implies, hard ticks have a hard shield and are shaped like a flat seed when unfed. Soft ticks lack the hard shield and are shaped like a large raisin. The soft ticks generally feed on birds and bats. Lyme disease is a bacterial disease caused by the bacterium Borrelia burgdorferi. 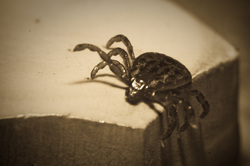 The disease is transmitted by an infected blacklegged (deer) tick (Ixodes scapularis) that bites its host. It's important to note that not all deer ticks carry the bacterium that causes Lyme disease. Rocky Mountain Spotted Fever Rocky Mountain Spotted Fever is another disease spread by infected ticks, either the American dog tick or the lone star tick. The bacteria that causes RMSF is Rickettsia rickettsii. Not all ticks will carry the infection. In recent years, the number of probable cases has increased in Illinois. Rocky Mountain Spotted Fever can be treated with antibiotics, and with early diagnosis, treatment is more successful. Curt Colwell, Ph.D. with IDPH has received 3 blacklegged / “deer” ticks (Ixodes scapularis) from Crawford County over the years. This indicates that the species may be present in the county. For it to be “established” by CDC criteria, we would have to have seen 6 specimens or 2 life stages. However, because the deer tick / blacklegged tick is established in Clark and Lawrence counties and in nearby Indiana it is likely that the species will be transported by deer into Crawford County. 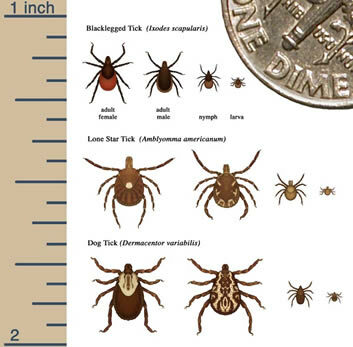 Blacklegged/ "deer ticks" are the main vector for transmitting lyme disease.